AFTER the MRT trains stalled along Circle Line yesterday, there were the usual long queues for shuttle buses and taxis. But a different sort of queue was seen at Bishan MRT's station control, shortly after service had resumed in the morning. 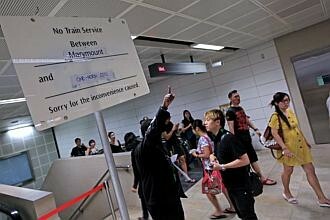 Commuters were standing in line for 'excuse chits' issued by SMRT staff. These are slips of paper, authenticated by SMRT, that riders can use to prove that their commute was affected by train service delays. This practice has been in place for more than two years but had gone unnoticed until the recent spate of MRT breakdowns, an SMRT spokesman said. The spokesman added that he was unable to say how many slips were distributed yesterday. The breakdown yesterday delayed some 18,000 commuters, many of whom were on their way to work or school. For Institute of Technical Education (ITE) College Central (Bishan) student Tay Jia Jia, 19, the delay meant getting to school late - for the second time this week. Miss Tay was also caught in a train disruption on Tuesday, between the Jurong East and Joo Koon stations. When she arrived at her school, she was marked as absent, even though she tried to explain to her teacher that the circumstances were out of her control. Mr Jeremy Koh, 38, a marketing officer who was affected by the delay yesterday, said he found the slips useful but expressed concern that they may be misused. 'Some people may use it to take half-day off,' he said. Another delayed traveller, Ms Ruby Chan, 39, an administrative executive, said she thought the slips would be useful for employees who had to abide by 'very strict attendance regulations'. Commuters began lining up for the excuse slips after a netizen posted a photo of the slip on citizen journalism website Stomp at 8am. In a posting, he said that the photo had gone viral on Facebook, adding that there would be no need for the slips if the trains were working.